Hollington United Football Club’s first team consolidated top spot with its ninth consecutive victory yesterday (Saturday). A 2-0 win at home to AFC Ringmer kept Hollington three points clear of Cuckfield Rangers at th top of the Mid Sussex League Premier Division, albeit having played two more matches. With the league entering the business end of the season, the Lions knew that three points were a must against a side they had already beaten twice this season. Hollington started well and created a host of chances, and it was no surprise when Dominic Clarke gave them the lead. The Lions continued to fashion opportunities and should have gone in at the break with a much bigger lead than just the single goal. The second period was a very scrappy affair, with neither side able to get any fluency in their play, but it was the Lions who looked the more likely to score. They duly did on 75 minutes when Jay Tomlin continued his goalscoring form when clean through with the goalkeeper. 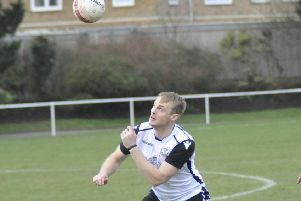 Hollington again showed great maturity to see the game out and continue their perfect winning record in 2019. Man of the match, sponsored by Flow-Right Plumbing and Heating, was Dan Hull. Hollington manager Scott Price said: “These players show more and more maturity every game they play in. I’ve never known a group of players who change every single week due to different circumstances have such a togetherness on and off the pitch. “Today we were missing Alan Foster, Frazer Fitchett, Sam White, Ross Southwood, James Hull, Dan Kearley, Tom Chalmers, Glenn Woodhurst and Wayne Giles, but ourselves and the second team fielded 28 players between us, which speaks volumes of where this club is moving. “Today’s game wasn’t a spectacle for the spectators, but for me I think we will take a lot out of a game where we weren’t at our best but looked solid. Hollington will begin a run of four consecutive away matches against bottom-of-the-table Buxted next Saturday. Mid Sussex League Premier Division top five (played-points): 1 HOLLINGTON UNITED 18-46 (+32 goal difference), 2 Cuckfield Rangers 16-43 (+42), 3 Balcombe 17-42 (+43), 4 Lindfield 17-36 (+36), 5 Forest Row 20-31 (+1).